Bureaucrats as Entrepreneurs: Do Municipal Telecommunications Providers Hinder Private Entrepreneurs? We consider how government-owned enterprises affect privately owned rivals. Specifically, we compare the types of markets that municipally owned telecommunications providers in the United States serve to the types of markets that competitive local exchange carriers (CLECs) serve. We find that CLECs focus on potential profitability while municipalities appear to respond to other factors, such as political considerations or the desire to provide competition to incumbents. As a result, municipal providers tend to serve markets that CLECs do not. 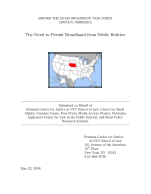 This is the report developed by a Broadband Advisory Committee established in 2006 in Saint Paul, Minnesota. It recommended a phased approach to building a network that could ultimately offer a full FTTH open-access network to everyone in Saint Paul. Is Publicly Owned Information Infrastructure A Wise Public Investment for San Francisco? San Francisco has launched an initiative to provide wireless access everywhere in the city. A number of Supervisors and residents have raised the possibility of the City following in the footsteps of over 200 other U.S. cities that already own information networks. To date, the City has not addressed that question, or at least no such study has been forthcoming. Cable, telephone and Internet industry giants are fiercely lobbying, using every tool at their disposal to gain a competitive advantage in telecom reform legislation. Some of those tools are easy to spot - campaign contributions, television ads that run only inside the Beltway, and meetings with influential members of Congress. Other tactics are more insidious. Jim Baller and Casey Lide are two of the foremost experts on municipal broadband systems in the United States. 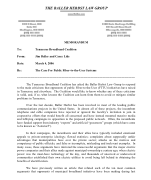 This report offers a clear and rational defense of publicly owned broadband systems. The discussion takes on philosophical, economic, and pragmatic arguments and comes to the conclusion that communities should not be prevented from building their own networks. Who Will Own Minnesota's Information Highways? Competitive broadband service and pricing is within reach of most Minnesotans if anti-competitive polices and practices are removed and municipal governments build broadband infrastructure, according to a new report released today by the Institute for Local Self-Reliance (ILSR). The findings are contained in "Who Will Own Minnesota's Information Highways? ", a report issued by the New Rules Project of the Institute for Local Self-Reliance. "Minneapolis and Saint Paul have a once-in-a-lifetime opportunity to develop an affordable, high quality broadband infrastructure that would benefit city offices, consumers and businesses," said co-author Becca Vargo Daggett, a former information systems administrator for a private company. 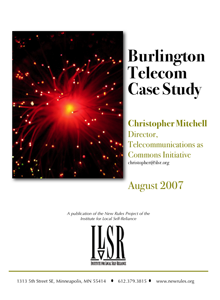 In 2005, when Lafayette, Louisiana was considering a community broadband network, it created an excellent report discussing how a publicly owned network can work to improve digital inclusion. Six years later, the report remains well worth reading. Public ownership provides more tools for making sure advances in communications technology benefits everyone.